Please note that the content of this book primarily consists of articles available from Wikipedia or other free sources online.In the foundations of mathematics, Russell''s paradox (also known as Russell''s antinomy), discovered by Bertrand Russell in 1901, showed that the naive set theory of Frege leads to a contradiction. It might be assumed that, for any formal criterion, a set exists whose members are those objects (and only those objects) that satisfy the criterion; but this assumption is disproved by a set containing exactly the sets that are not members of themselves. If such a set qualifies as a member of itself, it would contradict its own definition as a set containing sets that are not members of themselves. On the other hand, if such a set is not a member of itself, it would qualify as a member of itself by the same definition. 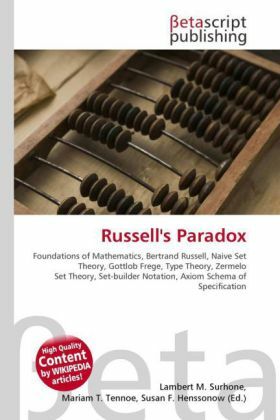 This contradiction is Russell''s paradox.